Serial monogamist Joanne is getting married – AGAIN. AND she wants her sisters to wear their bridesmaid dresses from her previous weddings. AND Aunt Sara’s been getting free samples from the bar. What could possibly go wrong? 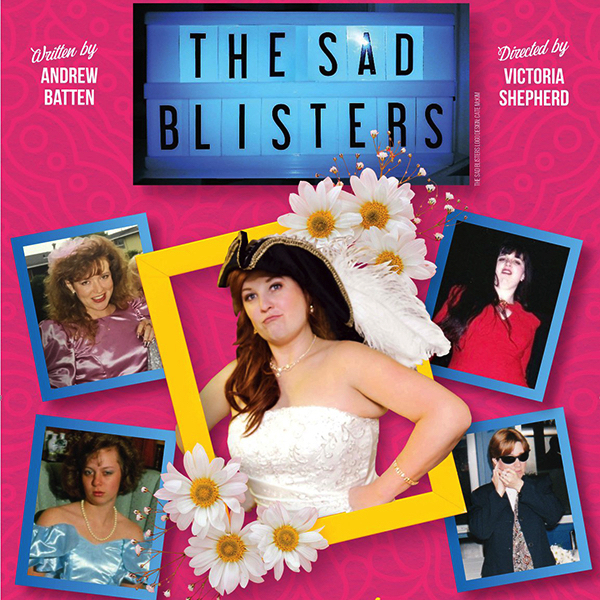 The Sad Blisters is loosely based on the family dynamic of the playwright’s wife, Debbie Batten, who has four siblings. One of her sisters, like Joanne in The Sad Blisters, was married three times to men with the same first name. Andrew Batten was a former playwright in residence at the Blyth Theatre. He described himself more recently as a “reformed lawyer and recovering teacher”. His previously produced plays include The Accelerated Theory of Hotness, Romeo and Rosaline, The House of the Rising Sun, Even As Also I Am Known, Jellied Salad and Or Not To Be. Batten was also an accomplished actor, and in the last 12 years appeared in numerous productions for Toronto groups such as Alumnae Theatre Company (Hedda Gabler, Sylvia, A Woman of No Importance), Amicus Productions (Les Liaisons Dangereuses), and Village Players (Tainted Justice). Andrew was fond of saying that “people listen when you tell them your stories”. The Sad Blisters, which we lovingly dedicate to Andrew. Written by Andrew BattenDirected by Victoria Shepherd. Featuring Bonnie Gray, Andrea Lyons, Anne McDougall, Cate McKim, Esther Thibault. VENUE: The Commons Space, 587a College St. (west of Bathurst), Toronto. Venue is on 2nd floor and is not wheelchair accessible. SHOWTIMES: April 12 – 27, 2019. Performances are Thu/Fri/Sat at 8pm; matinees Sat & Sun at 2pm. RUNNING TIME: Approx. 80 mins. There is no intermission. TICKETS: $20 regular; $15 student/senior/Arts Worker.